Not gonna lie, I've kinda got a weakness for that 80's futuristic, 8-bit, Nintendo-esque, synth-pop sound, and Austin duo Fizzy Dino Pop has really nailed it! When it comes to their music, "fizzy" is definitely the operative word. They create bubbly, upbeat, feel good, space electro pop that makes it pretty much impossible not to find yourself moving around to! 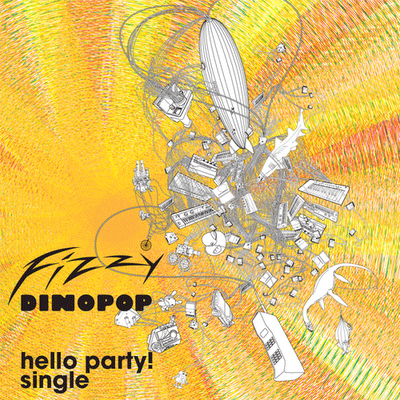 Fizzy Dino Pop has recently released a free digital single for their fun and highly likable track 'Hello Party! ', which I can very easily see becoming one of the hottest indie dance party tracks of early '10! Kinda hoping this is the direction electronic music takes in the future. Love it! Loved Fizzy back in the day had made a huge mashup mix with about 30mins of greatness. Avery sold out to the masses but i still thoroughly enjoy the new FDP.